Queen City Fresh’s Chris Stevens (QueenCityFresh.com). Loose Screw Beers’ Matt Rowe (@LooseScrewBeers on Twitter). If you don’t read these guys blogs and/or follow them on twitter I’d highly advise it. They’re all cool and knowledgeable dudes each covering Cincinnati beer in a slightly different way. Also we’re each blogging our thoughts on this whole event and covering everything slightly differently so you should spend a few minutes reading all their posts on the event. But back to the King of the Cincinnati IPA competition. I’m not sure who’s idea this first was but over the course of ~200 some emails we set a date and a place and got all the local brewers to donate growlers of their IPAs. To ensure fairness Jack & Matt stepped in to randomize the growlers and take care of pouring the samples so we were blind to what beer was in what cup. The city has some fantastic IPAs some like Mt. Carmel, Cellar Dwellers, and Moerlein are more classic IPAs while Rhinegeist and MadTree produce more over the top hop-focused IPAs that are currently the rage. Rivertown comes in with a session IPA aiming for plenty of flavor with less alcohol so you can drink it over an extended session, hence the name. Blank Slate brings in a very different kind of IPA, as it does for all it’s brews, with what it calls a White IPA. It’s described as a wheat IPA “containing two different wheat malts in addition to oats and honey malt meld with copious amounts of Columbus, Cascade and Nugget hops”. With all these slightly different IPAs it was hard to pick 1 winner but alas we did, in fact we picked two! Rhinegeist’s Truth and Blank Slate’s Lesser Path tied for first in the initial scoring. 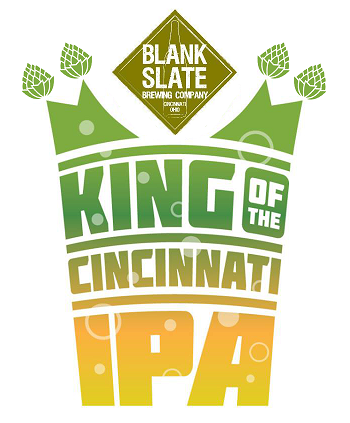 We then did a final round with no scoring just a straight up preference pick and while I myself went with Rhinegeist on the basis of it being more a true IPA I was out voted 3 – 2 so Blank Slate’s The Lesser Path took the King of the Cincinnati IPA title. Since we crowned a king IPA for the Queen city folks may be anxious to give this a taste. If that’s you then the following list should help, but these places may have already sold out so call before you go! Since our winner is draft only I want to give a special mention to Christian Moerlein’s Northern Liberties which was the highest ranked packaged IPA we tasted. Now I’m also realizing that out of 10 beers we tried only 3, Mt. Carmel, MadTree, and Moerlein are available in non-draft forms. I want to thank all the breweries for making such great beer and letting us try some, all the bloggers for helping throw this together, and the Brew Professor’s family for putting up with us all for a night! We all had such a great time that it’s agreed we’ll do something like this again. Perhaps another style of beer or perhaps tap rooms or perhaps some other idea we’ve yet to think of! I think my favorite IPA in the city is 50west’s Coast to Coast. I went into this thinking either PsycHOPathy or Truth would be the winner. Pingback: Blank Slate: “Lesser Path” | Cincinnati Beers...a local review on local brews, The "Brew Truth"